From Eklutna Lake to Portage Glacier, there are endless beautiful, photo-worthy locations in and around Anchorage. Whether you’re into architectural details, dynamic lighting, stunning backdrops, fun activities or even scenic views, the Anchorage Museum has you covered. With bikers, birdwatchers, beavers and model boats, there is always something going on at family-friendly Westchester Lagoon along the Coastal Trail, and you know you’ll always have the iconic backdrop of the mountains. Visit Kincaid for an urban hike or frolfing, but make sure you snap a photo of Sleeping Lady, or even Denali on a clear day, while you’re here. There’s no shortage of vistas of Anchorage, the valleys of the Chugach Mountains and wild flora and fauna from this peak. Don’t worry – while you could summit Flattop, you could also use the paved overlook trail just off the parking lot to capture these shots. While you wait for the bore tide or even beluga viewing, this is a great spot to capture photos of Turnagain Arm and the mountains surrounding it. You may even be fortunate enough to see Dall sheep along the cliff side. It may seem tempting but do not stand on or cross the railroad tracks. Further improve your odds for a truly iconic wildlife shot - a visit to the Alaska Wildlife Conservation Center puts moose, musk oxen, foxes, eagles and many other species front and center. Don’t forget to check out the boardwalk for sweeping views of Turnagain Arm. 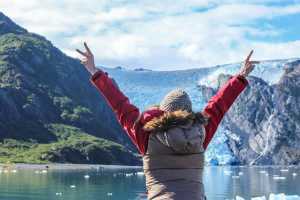 One of the most easily accessible glaciers in the Anchorage area, you can get up close and personal with Portage, whether you choose to hike, cruise, ski or ice skate. Certainly a berry-picking favorite amongst the locals, Arctic Valley also offers seemingly endless views of the Chugach Mountains. The mountainous gravel road to Arctic Valley is off the beaten path - literally. A bit removed from the city bustle, but still easily accessible, Eagle River Nature Center offers a sense of solitude and an intimacy with the wilderness. Take advantage of the availability of the naturalists and family-friendly programming while you’re here. Fed by a glacier, Eklutna Lake has several trail options – summit a peak, stroll or bike around the lake, or explore the shore by kayak. Wherever you decide to &apos;gram, please be sure to #visitanchorage!